Shuvu Yerushalayim, There’s A War Raging! Shuvu’s Yerushalayim elementary school was the first in Shuvu’s vast school network. Many of its graduates go on to study in distinguished yeshivos. The school, dedicated by Reb Reuven Wolf, who now heads the Keren for French Jewry, in honor of his parents, is a showcase for what Shuvu can achieve. The school’s Neve Yaakov campus is now on the frontlines of a war against Yiddishkeit. For the first 20 years of its existence, the Shuvu Yerushalayim elementary school was forced to move from one location to another. However, five years ago Mayor Nir Barkat met with Shuvu’s leadership, headed by Chairman Mr. Abe Biderman, and granted the school a building in Neve Yaakov, committing that this would remain the school’s permanent home. Since then, Shuvu invested many millions of dollars in the facility. After Shuvu sunk a tremendous amount of money in the building, the municipality threatened to relocate the school. In addition to the financial impact, this city’s well-publicized threat nearly destabilized the school and impacted enrollment. Over the past months, those threats have intensified, with rabbonim, askonim, and Shuvu staff members working tirelessly to resolve the issue. 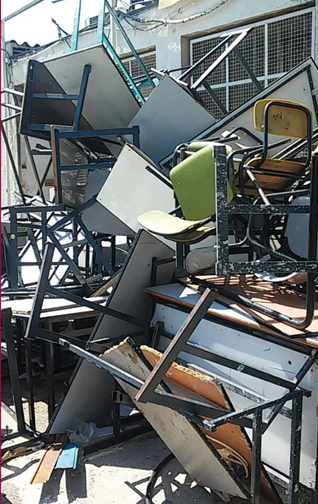 Now the Yerushalayim municipality has taken the matter to a whole new level, violently seizing the school building and vandalizing the school’s property. Under the cover of night, municipal workers broke into the school, looted the classrooms and trashed everything in sight. Throughout the past years, Shuvu has shared the spacious Neve Yaakov campus with another school. Now, the municipality inexplicably chose to turn the entire campus over to that school, although its enrollment does not justify such an expansion. The municipality has “graciously offered” Shuvu the use of a set of dilapidated trailers barely fit for use. However, Shuvu parents have made it clear that they refuse to send their children to a makeshift facility, and will only stay in Shuvu if the school has a proper building. Shuvu’s Director, Rav Chaim Michoel Gutterman, notes that until just a few days ago, the Keren for French Jewry intended to enroll students in the Shuvu school, but they are now unable to do so because of the circumstances. The Knesset Educational Committee met recently and began an inquiry into these events. They turned to the mayor to explain what transpired, but received no satisfactory answers. The situation has caused great anguish to gedolei Yisroel, who not only fear the prospect of children leaving Shuvu and enrolling in public schools, but view with alarm this broadside attack on the Torah community. The rabbonim of the Neve Yaakov neighborhood have met in an effort to pressure the municipality. At the meeting, the rabbonim highlighted the critical role Shuvu plays in their neighborhood, and noted that the Shuvu school could easily attract hundreds of children of recent olim who have just settled in the Neve Yaakov area if only the school would not have to face the ongoing threat of relocation and other municipal harassment. Following the meeting, letters were sent to the chareidi Knesset members and Yerushalayim municipality members requesting their assistance. They, together with the Chairman of the Knesset Finance Committee MK Rav Moshe Gafni, and Chinuch Atzmai heads Rav Avraham Yosef Leizerson and Rav Eliezer Sorotzkin, have been working with great mesirus nefesh on Shuvu’s behalf. Thus far, their efforts have not only been rebuffed, but the municipality has responded with brute force. Dare we stand by as an established mossad hatorah is brazenly ransacked? Protest this travesty now! Write to Mayor Nir Barkat and Prime Minister Benjamin Netanyahu today! The new school year is only three weeks away. The fate of hundreds of neshomos is in your hands!